When all of your teeth are missing sometimes dentures will become difficult to wear. This difficulty only worsens over time. When teeth are missing, the bone under the gum gradually resorbs or gets smaller making the dentures slip and rub painful sores on the gum. Fortunately there is a solution to this problem. 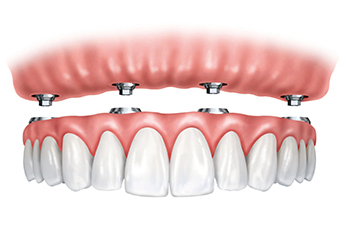 Implants can be placed and teeth connected to the implants to replace the missing teeth. This can be permanent and non-removable. For patients with few or no remaining teeth, replacing all of your teeth with just 4-6 dental implants may provide a more permanent and comfortable solution. You will not be without teeth during treatment. Bruce B. Wiland, DDS provides dental implants in Indianapolis, IN and surrounding areas. Why keep struggling with removable dentures or partials? You can have your new set of teeth and a more stable bite in just one visit. If you require dental implants in Indianapolis, Kokomo and Richmond, Indiana, contact our office to schedule a consultation today.